Here's a hot piece of news from the ladies at style.com (click here for full story). You're looking at the three nail colors - April, May, June - slated for Chanel's spring 2012 release. I bet you June's going to be this year's Mimosa. Of course, spring collections usually hit counters late December/early January, so come the real April/May/June, these will already be old news. Here's a link to how they look on the models' nails: http://blog.stylesight.com/beauty/backstage-beauty-chanel-nails-ss-2012. Big love for April! P.S. : We're so close to Chanel Holiday. Best Things In Beauty is having a swatch-a-thon of the entire collection, so visit her blog and plan your purchases accordingly. 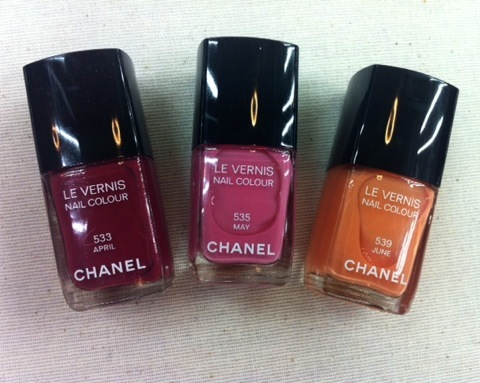 i have to admit, chanel's vernis seasonal releases are always something i look forward to. I love April, May, and June but I have to admit I'm more eagerly awaiting the oyster shade that matched the theme on the runway. So stunning for early spring! I love that Chanel did months as names. Total transition from winter to spring for those of us in the northern hemisphere.